VietNamNet Bridge - Vietnam is one of 15 countries on the world’s medicinal herb map. However, the priceless treasure has not been exploited in an effective and sustainable way. Lam Van Tinh, from Hai Ha commune of Hai Hau district in Nam Dinh province, is one of the farmers who chopped down ornamental trees to grow dinh lang (Polyscias fruticosa). Tinh said it is very easy to grow and take care of dinh lang, while the required investment capital is low. It just needs decayed muck and phosphate to develop well. Cultivating one sao (360 square meters) of dinh lang, one receives revenue of VND150-170 million after three years. After paying for seedlings and fertilizer, one would pocket VND19-21 million a year, or VND520-580 million for every hectare per annum. In the commune, Pham Quoc Hoan is called the ‘dinh lang billionaire’. Hoan has been developing 4 mau (1 mau = 3,600 square meters) of dinh lang since 1994. His youngest son plans to come back to the home village after finishing higher education and enlarge the family’s dinh lang garden. Pointing to the 3-year old garden, Hoan said he once offered to sell the garden for VND1 billion, but he refused. “The older the garden gets, the more valuable it will be,” he said. Tran Thi Hong Phuong from the Traditional Medicine & Pharmacy Management Agency said at a workshop held recently that the potential of developing medicinal herbs in Vietnam are great. Quang Ninh, Hung Yen, Hai Duong, Nam Dinh in the north and Nghe An, Kon Tum and Lam Dong in the central region all are provinces with great advantages in developing medicinal plants. Phuong stressed that farmers should be encouraged to grow medicinal plants because this can bring profits 3-10 times higher than rice cultivation. 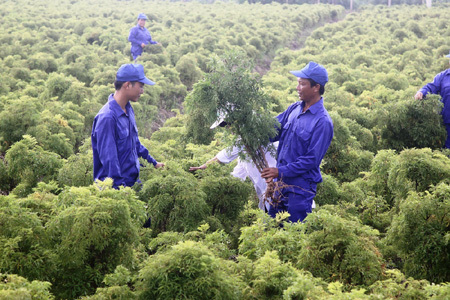 In Nam Dinh, for example, farmers can earn VND900 million from every hectare of dinh lang, VND500-900 million from duong quy (Angelica sinensis) and VND300-400 million from sinh dia (Rehmannia glutinosa). She went on to say that farmers need support in all phases of medicinal herb production and business chain, from production to harvesting, processing and distribution. At present, Vietnam still has to export raw herbs at low prices. Chinese businesspeople visit herb growing areas to collect precious herbs and carry to China. After processing medicine from the herbs, they take the products to Vietnam to sell at exorbitant prices. Thai Huong, owner of TH true Herbal brand, is moving ahead with a plan to develop herb gardens. Her business now has 15,000 hectares of herb growing area where plants are cultivated with high technology.